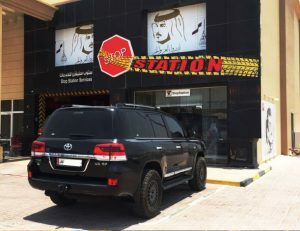 STOP STATION is one of the most trusted Off-Road Accessories and Modification Company in Qatar. We are specialized in customizing off-road vehicles to suite the outdoors, camping and extreme off-roading application. When it comes to customizing your dream vehicle, Stop Station is the one stop you will ever need. Our objective is to deliver premium quality and branded products combined with expert fitting service to insure customer’s satisfaction and to exceed expectation by providing superior customer service and competitive value. Our mission is to earn our Customer’s loyalty and trust by delivering the best quality of products and services along with excellent work ethics, integrity and enthusiasm. We will function as a team focusing on meeting and striving to achieve high level of Customer’s satisfaction by exceeding their expectations. To be the favorite STATION to customers for car modification and accessories. To be a leading car accessories distributor in the State of Qatar. To be the first and last STOP needed to gear up!